Snow in the South is something that doesn't happen often. So, when it does, everyone stops and stares. Schools close, bread and milk disappear, and social media becomes a virtual winter wonderland of picture after picture of snow covered trees and bright, white scenery. While many of my friends woke up to white, fluffy stuff (or let's be real, maybe more ice), here in South Alabama I woke up to another rainy, cold day. Basically, every other day here in Mobile. Looking at the radar, the line goes from blue to green right about where I am. Typical. No winter wonderland here. But, with each picture I see, it reminds me of the snowy days spent in Tahoe. Shoveling more snow than I've ever seen in my entire life. Watching it blow from the tops of the pine trees. Attempting to learn how to ski on the same mountains that the professionals do. The stark contrast of the blue skies against the white ground. That's my favorite. So, while a lot of central Alabama and parts of Mississippi and Louisiana and Georgia all enjoy their wonderlands today, I'll just be staring over these pictures and more while remembering those quiet, peaceful hikes through snow covered trails. While in Las Vegas, we had the opportunity to do a little exploring. We either were heading to The Hoover Dam or Red Rock Canyon. And although I hate that I missed out on making dam jokes, I'm so glad we chose Red Rock Canyon! After leaving California about three years ago, I have missed getting outside everyday and hiking outside in the beautiful west. While the South is beautiful, the West is equally breathtaking! Red Rock is about 30 minutes or so outside Las Vegas. Huge rocks with red stripes plopped down in the middle of the desert. Put it against the backdrop of a bright, blue sky and it's magnificent! Have you ever been to Red Rock Canyon or Las Vegas? Where is your favorite place to get outside? Check out more photos from this trip here. I sometimes think it would be fun to have job where travel is a big part of it. Then, I realize that I very much like to stay at home. I love traveling, I love flying, I love exploring new places, I love meeting people from everywhere. But, I also really love the weekends where I don't leave my house. Those are the weekends that I look forward to after nights spent out or weekends spent traveling. April was a month filled with busy weekends! Something that usually doesn't fill my calendars. While it physically and mentally exhausted me, I absolutely LOVED all the moments and getting to spend time with friends and family. The first week of April was spent celebrating my mom and dad's wedding anniversary (aka our familyversary). They stayed in Mobile, explored during the day, relaxed, and then we had dinner each night they were here. (It was great for me! Thanks for all the meals, Mom and Dad!) One night they were here we watched the movie Vegas Vacation, all in preparation for my trip to Vegas. It is a hilarious movie and if you haven't seen it, watch it. So funny! My trip to Vegas was actually nothing like Clark Griswold's. One, the only time I set foot in the casino was to eat at a buffet and grab Starbucks. And we didn't visit the Hoover Dam, but if we had, I wouldn't have veered off the tour and tried to climb the thing. I would however have made plenty of "dam" jokes. It just required people. You can't pass up that opportunity. Just like the many times we would travel to Sardis Dam in Mississippi when I was younger. On the way we always passed The Dam Store. And every time, it never failed, my sisters and I would make dam jokes. And the whole car would laugh and we would just lose it! We still make those jokes and laugh today. So, there was no veering off tours or winning of cars (seriously watch the movie, it's hilarious). I was in Las Vegas to partner with a church plant and help them get ready for their neighborhood Easter Egg Hunt. We stuffed 15,000 eggs and passed out thousand of flyers around the neighborhood. 15,000, you read it right. It was at times monotonous and annoying when the plastic eggs wouldn't close. But, once we had a good assembly line going, easy peasy and smooth sailing. While there we got to visit a couple church plants and it was great! One was pretty similar to the church I attend (and work at), the other two were plants with small congregations. I really enjoyed being a part of their fellowships for the weekend. It was refreshing and encouraging to be reminded of the simplicity of the Gospel, and how ultimately, our mission as believers is to love people where they are at. It's what Jesus did and it's what I want in my relationships. How can I not offer that to others? That's a post for another day. Today is for a photo dump of photos from Las Vegas! One of my absolute favorite things about flying out west is that there is a good chance you will fly over the Grand Canyon. I've stood on the rim before, but flying over it gives a while new perspective! So amazing. One of my favorite places and sights. When we weren't stuffing eggs or passing out flyers, we got to visit around and see the city some. One evening we went and walked The Strip. Each casino is themed differently and it was literally like we went to another country when we walked through them. The architecture was awesome! At The Venetian there was a Carlo's Bakery, from the man behind Cake Boss, and it was delicious! I got a Hazelnut Lobster Tail and oh my goodness. I want one every day. We watched the fountain show at The Bellagio and went to the conservatory inside. It has tons of flowers! I read somewhere that all the flowers are changed out every two weeks there! The top of The Bellagio offers a great view of The Strip! And lastly, I can't head out west and not hit up In-N-Out Burger. So yummy, I love it. Those cheeseburgers, fresh fries, and chocolate shake. Yes, please! Glad we got to stop there for a bite to eat! I remember going on my first mission trip ever when I was in high school. It was the first time I had ever really been away from my parents, my first time really out West, and my first time on an airplane. I was so excited, but also nervous. Stepping into Arizona was a new world to me, even though I was still in the United States. It brought me new friends, new realizations about people and life, and challenged me greatly in my walk with Christ. One of the most memorable moments is when I was standing on a plateaued hill, in the desert of Arizona, watching the sunset. The sky literally seemed to be painted, as it turned so many different colors. God as Creator became real to me then and He's never let me forget that moment. Since then, I've tried to serve Him locally and domestically as best as I've can and go wherever He has led. He really does work in mysterious and sometimes funny ways. Like when as a freshman in college, I sat with a friend at a cafe in New Orleans and told her that I felt like God was leading me there. And He did in the summer of 2011. Or the summer I served in Mobile, many years before I would eventually call that city home, as I do now. Then, He somehow got me to California, the absolute farthest I had ever been from home or anyone I knew. I went fresh out of college and knowing no one. Simply ready for adventure. And that it was. Because when following the Lord, it is certainly an adventure. A beautiful, fun, crazy, most times scary, adventure. I've visited places I've only dreamed about and somehow, I'm not sure how, but I love them all so much. I smile when I think of them and I love when they come up in conversation (or let's be honest, when I bring it up because I want to talk about it). I smile because of the places I've been, the people I've met, the pictures I've taken, or simply just my memories. I smile, because I often can't believe that the Lord would give me such great chances. And I smile because His love is just that great, that He did, and still does, give me those chances. Missions is in my heart. The people, the places, the food, the smells. They get in my heart and they never let go. I don't want them to. I want to hold on to them forever. I want the memories to grow stronger, but also make room for new ones to form. With new places, new faces, new smells, and new sunsets. The fall following college graduation, I packed up my first apartment in two groups. Things that my parents would take back home and put into storage and things that would fit into two suitcases and a backpack that would come with me to California. Never would I have ever guessed that the Lord would lead me to California, but it opened up a whole new world to me and allowed me to visit places and meet people that would change me. I'm sad to say that I haven't shared a lot about my time on the West Coast, but I have been wanting to. What better way to start than by sharing photos of the beautiful and magnificent Yosemite National Park. Yesterday was the the 125th birthday of Yosemite National Park! The land was first protected by President Lincoln in 1864, but didn't become a national park until October 1, 1890. Famous spots include El Capitan, Yosemite Falls, Half Dome, and more. After spending time in the Tahoe area, the Sierra Nevada region of California is now one of my favorite places in our nation. It is absolutely gorgeous! From Lake Tahoe, to the rising mountains, tall pine trees, clear rivers, great hiking, and the beauty of deep snow in winter. Guys, I just love it. The trek to Yosemite from Tahoe City, is beautiful in itself with winding roads that take you farther and farther up and down through twists and turns. Then, after miles of trekking, you reach what they call the "Tunnel View" at Yosemite. It's your first glance into the park and one that will take your breath away. Guys, the Lord our God is a wonderful Creator and Yosemite National Park is one of His greatest. Enjoy this small glimpse into a beautiful and breathtaking part of our world. Happy Birthday, Yosemite. Stay magnificent. The Tunnel View before entering into Yosemite National Park. El Capitan is on the left, Half Dome seen in the middle, Three Brothers on the right, and Bridalveil Falls seen below Three Brothers. I can't explain my first thoughts when seeing the park. It was like the first time I saw the Grand Canyon, tears may have come to my eyes. The view from Glacier Point. Half Dome is on the left (people climb this!) and Vernal Falls and Nevada Falls on the right. Bridalveil Falls. The falls got its name because when the wind blows, the water mist seems to fly out and it looks like the veil of a bride. El Capitan. Guys, when we first drove past this, it literally made me say, "Wow!" This is the largest granite monolith in the world! It is over 3,000 feet high and people come from all over the world to climb it. Lower Yosemite Falls. You can't even see the Upper Falls in this picture and I wish this picture did it justice. But, it simply doesn't. The height of the falls and the sound of the rushing water are something to be seen for sure. Mirror Lake. My absolute favorite stop while in Yosemite and this is probably one of my top favorite photos that I have ever taken. (It even looks amazing in black and white.) The reflections are absolutely stunning and the water is ice cold. I could have stayed in this one spot for hours. Have you ever been to Yosemite National Park? If not, I truly hope you get to experience it one day. What other National Parks have you visited? This past Saturday marked the 10 year anniversary of Hurricane Katrina making landfall. One of the hardest hit areas, no doubt, would be New Orleans, Louisiana. We all remember the pictures, we all remember the destruction, we all remember the heartbreak. I remember my first trip to New Orleans well. It was my freshman year of college, two years after the hurricane. A short time spent connecting with people, hearing their stories, and lending a hand through the rebuild. I remember sitting outside at a cafe in the French Quarter and telling a friend that I felt like God was leading me to New Orleans, even if for a short time. Three years later, He did. And New Orleans became another place that stole a piece of my heart. During my summer in New Orleans, I saw how the city not only rebuilt, but was once again thriving. I was able to enjoy a city full of life, culture, good food, and wonderful people. I've been back to New Orleans a few times since the summer I lived there and each time I drive into that city it's like the first time. I always visit my favorite spots, but I always discover something new. So many little details float around my apartment, paying tribute to New Orleans. Photos around my apartment, coffee table books, and a bag full of Mardi Gras beads and throws from my first carnival in the city. Even two fleur-de-lis coat hangers are hung by my front door and the moment I saw those before I moved in, it felt like home. The memories of Katrina will never leave, but the people of New Orleans are strong and resilient. They love and care for their city and their people. I am thankful they let me experience that in the short time I lived there. And I'm thankful they continue to share it with me every time I step food within its limits. Have you ever been to New Orleans? What is a place that has your heart and you love to visit? There's nothing better than being a tourist in your own city. And that is something that I'm looking forward to doing more of this summer. One Thursday, my roommate and I were both off from work, so we decided to play tourist. Mobile is full of museums and I'm also a big fan of museums, so we decided to take advantage and tour both the history and art museums! The History Museum of Mobile is always free admission and the Mobile Museum of Art has free admission and extended hours on Thursdays. There was no better day to go exploring! I really enjoyed the history museum! It's a beautiful building downtown, full of artifacts and exhibits filling up almost every room of the two story Old City Hall. I could have spent much more time there, so I'm looking forward to going back. Next time I hope to have my Dad with me, as he's a big history fan himself. I enjoyed walking around and reading about the history of Mobile. Some things I knew, others I didn't. Seeing as I still consider myself pretty new to the area, it was a great experience and gave me a deeper appreciation of this city. Enjoy some of these scenes from our quick trip there! If you were playing a tourist in your own town, where would you go and what would you do? I'm beginning to notice a trend when it comes to my travel posts. A lot of them involve me being around some form of water. I've always said that wherever I live needs to be near some form of water. Lake, river, ocean. I'll take any or all. I love being near the water and the breeze that hits you when you're standing on the shore. Recently I took my Sunday afternoon to head down to the beach. I'm only an hour away! Seriously, why does this not happen more often? Only an hour from views like this? That's another reason why getting there more often is one of my June goals! What is one place you want to visit more of this summer? 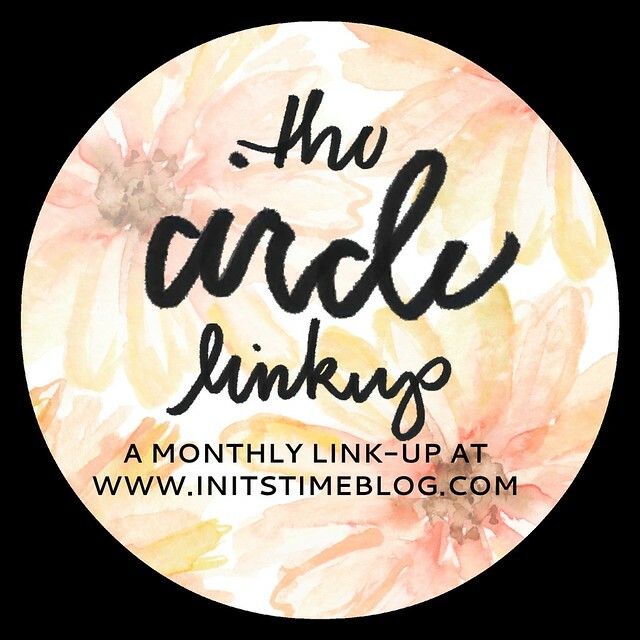 Linking up with Kiki and friends for one of my favorite link-ups of the month, The Circle! We all love bucket lists! We like to think of different things that we would love to do one day. If we had the chance to do anything, we would go and do it! It's fun to daydream about the things that you want to do one day and to look back and remember the things that you have done. Big or small, it's making memories and that's what it is all about. A reverse bucket list is a list of the things that you have already done. Here are some of mine. Enjoy! Saw the Grand Canyon. I cried at first sight of it. Went to a hot air balloon festival. Celebrated Mardi Gras in New Orleans, Louisiana. Went to a national park, Yosemite. Walked across the Golden Gate Bridge. Saw the Redwood and Sequoia trees in person. Donated 10+ inches of my hair. Visited the Pacific Ocean and put my feet in. What things are on your reverse bucket list? Link them up or list them below!